This post is long overdue as w’ve had so many of you ask us what is the breakfast to give you energy, satisfy your appetite, and set the stage for sucessful day. Many of us claim that we don’t have enough time in the morning to make something healthy, opting for a bowl of sugary cereal or a slice of toast, if we eat anything at all! Well, you have no excuse now! 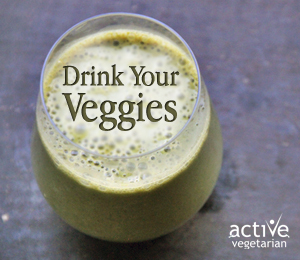 Smoothies are a fantastic to-go meal in a glass packed with nutrients. They take minutes to make and can be portable – just pour into a travel mug and off you go out the door. 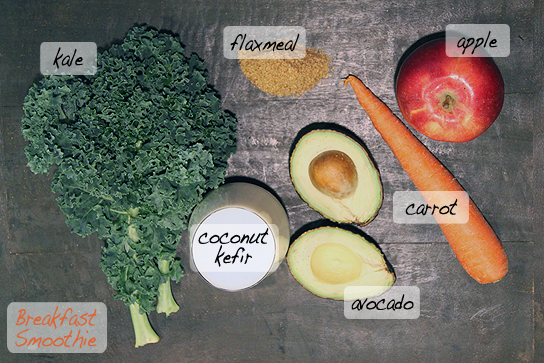 I make my smoothie with homemade coconut Kefir, but the smoothie works great with any sort of milk. If you are using store bought almond milk be sure to check the sugar content, as many can be packed with sugars. My smoothies tend to be seasonal, so apples are big right now. 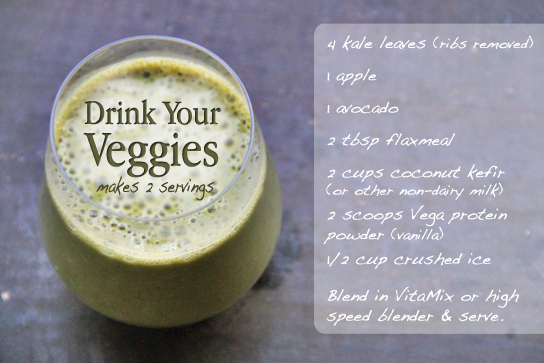 It’s fun to mix it up as different fruits and vegetables come into season. Beets are great and make the smoothie a fantastic color. Have fun with it. One of my favourite ingredients is an Avocado! The avocado fruit is high in protein, as well as containing useful quantities of zinc, folic acid, B vitamins and plenty of fibre. It is also high in fat, but it is mainly high in the healthy monounsaturated fats, so it’s all good as your body needs these fats to function properly. All in all, this smoothie is jam-packed with plenty of natural plant-based nutrition and it’s a perfect start to any morning! This looks really good – I can’t wait to try it! How do you make coconut kefir? I would love to try that too. Thanks for sharing – I love your podcasts too, by the way! What a great recipe! I am embarking on a new green juice journey and plan to incorporate smoothies into my routine in the future. I will put flax meal and protein powder on my list of things to try!